Unstructured data such as photos, emails, texts and audio files can quickly overwhelm an organization’s storage capacity. The fact is, file growth shows no sign of slowing down. While just adding disks may be part of the answer, the wrong approach can just end up creating an administrative nightmare. 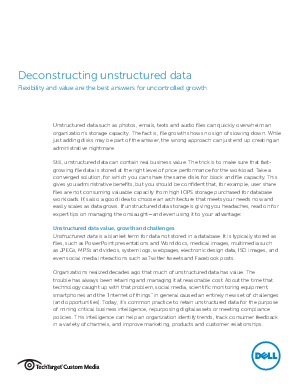 Still, unstructured data can contain real business value. If unstructured data storage is giving you headaches, read this white paper for expert tips on managing the onslaught—and even using it to your advantage.